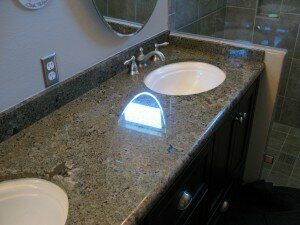 This bathroom counter was in pretty good shape but had lost a little luster and had a few chips in the edge. A light compound polishing brought the surface to a high glossy shine and adhesives were color matched to correct the chipped areas. Sometimes all you need is a stone maintenance, not a full restoration. This job took about an hour and what a difference it made for our customer.